For decades, millions of DIY'ers have been lifting their vehicles with floor jacks and stands. And among these ranks of wrenchers, a fair portion are simply sick of this outdated method of getting under vehicles. This group prefers a method of lifting cars that's safe, hassle-free and portable. We know most of these enthusiasts—if given the opportunity—would love a full-size car lift to work under. The main factor that prevents people from getting a two-post lift is simple. Their ceiling height won't allow for it; most of the time, only professional shops and custom garages feature 13 or 14-foot ceilings that can accommodate a full-size lift. That's where some homeowners turn to portable lifting options. Portable car lifts follow one basic principle: they can be removed from the work area and used somewhere else. The QuickJack portable car lift, for example, leaves an extremely small footprint and offers 21 inches of rise. For those tired of using jacks and stands, portable car lifts are safe to use and much more ergonomic to set up. In spite of the benefits of portable lifting systems, there are plenty of experienced wrenchers who are no longer interested in slinking around on creepers. And that's where we arrive at GrandPrix, a two-post lift unlike any other. It fits in garages with low ceilings and has the same industrial-grade design and indispensable safety features of permanent lifts found in professional shops worldwide. Below we offer compelling reasons to explore the GrandPrix as your preferred lifting option. 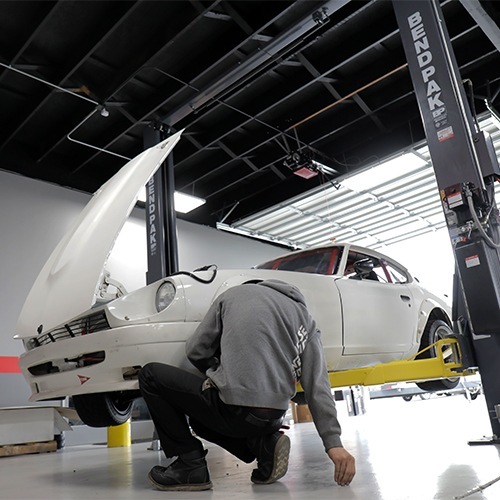 GrandPrix is engineered unlike any other car lift. The overhead bar contains a single hydraulic cylinder that pulls on the internally-routed lifting cables. Each column contains two oversized sheaves that prevent abrasions, wear and fraying. Because the cylinder engages the entire cable network at the same time, there’s zero risk of an unbalanced lift. Portable two-post lifts, on the other hand, use a flow divider to keep vehicles level. Since they rely entirely on hydraulics to power their lift mechanisms, a flow divider is used to ensure equal pressure gets to both sides of the lift, and the lift remains level. With solid engineering, flow dividers work great. QuickJack, for instance, is well-designed and offers a perfectly even lift when properly operated. Even though portable two-post lifts are prone to perceptible imbalances, the problem is easily fixed with a higher-quality flow divider. But, that cuts into the “value” of the lift (it raises the price). The GrandPrix gets around this issue with cutting-edge engineering. We’ve eliminated the need for a flow divider through clever placement of the hydraulic cylinder, and our columns strategically route the wire ropes through the columns, keeping them safe from weather and accidental damage. There's never a risk of the arms lifting unevenly, so you can trust GrandPrix like you would trust the safety of your vehicle at your favorite neighborhood auto shop. GrandPrix's design lets us incorporate oversized cable sheaves that drastically extend the efficiency, as well as the durability of the lifting components. Because the cables and cylinder work together, the GrandPrix effortlessly achieves 2:1 lift. In other words, every inch of movement on the cylinder results in 2 inches of cable lift. It essentially lifts and lowers vehicles twice as fast as most two-post lifts. Over time, this saves hours that would otherwise be spent standing around holding an "Up" button. While portable lifts offer a one or two-year warranty on the lift structure and/or hydraulic components, the GrandPrix offers an industry-leading five-year warranty on the lift structure, two-year warranty on the hydraulic cylinders and one-year warranty on everything else. All labor, parts and shipping costs are free for the first year, which includes on-site repair service. Manufacturers will sometimes offer an extended warranty that costs hundreds of dollars on top of what you already pay for the car lift. GrandPrix offers the best warranty in the business without tacking on anything extra. We don’t have "gotchas" full of hidden charges and conditions; we simply put the work in to earn the right to your business. Just like GrandPrix, portable two-post lifts need to be bolted to the ground. So, it’s common for people to leave them up and treat them like permanent lifts. If that's the case, why not ensure your lift is heavy-duty and backed by the best standards and warranty in the industry? Why not stop settling for less and start expecting more with GrandPrix? With three models to choose from (GP-7LCS, GP-7LC and GP-7), if your ceiling is restricted by a low ceiling, we have a lift that will not only fit comfortably, but provide an extra level of stability and safety unlike any other lift in its class.